Recently had a Korg MS20 to look at that was exhibiting some very odd behaviour. Generally the tuning was a bit off and there was some residual LFO modulation of the VCOs even when all modulation controls were at minimum. Odd as the measured keyboard voltage looked OK. Took the synth apart (the MS20 is not that easy as all the pots have to be un-done just to get at the board) and it was found that the faults changed if the internal looms were moved about – even stranger. Usual suspects checked (power supply voltages etc.) and everything seemed OK. Time to check with an oscilloscope and bingo – several volts of parasitic oscillation at a frequency well above audio all over the ground plane. This was going to be tough as there are a large number of culprits (op-amps) on the main board. Started at the main regulator and hunted for the IC where the maximum oscillation and tracked it down to the buffer for the keyboard divider. Changed IC and – no change! Hmmm, that’s odd. Back to circuit diagram and no supply decoupling around offending IC (actually very few anywhere) so time to strap a couple of 22n capacitors close to the IC across the rails and hooray – no more oscillation. Calibration of keyboard voltages went back to exactly the right values, oscillators were re-calibrated and were accurate within a cent across the entire keyboard, re-calibrated everything back to the original Korg spec and the whole synth went back to sounding really good. Recently been fixing an ARP sequencer which arrived in a non-working state. After some time with an oscilloscope and a couple of replacement parts normality was restored. So while testing I pondered the artistic use of such a beast, surely with a maximum of 16 notes it must be very limiting. However I came up with a way of using it that seemed to give endless variations but with the chance to determine how things go so it is not a totally random sequence. First set up a number of notes that have a reasonable musical relationship but make sure that you program in more than one occurence of the notes you want to hear most often. Say 3 of one, 2 of another, 2 of another and one of a note you only want occasionally. You then run the sequencer in random order mode and you will get a constantly changing stream of notes whose probability of occuring is determined by the number of duplicates you have put in, more duplicates ensures that the note is heard more often. The final sneaky bit is to use the skip function and that allows adjustment of the probability of the occurence of a note being played on the fly. To complete this I used the other 8 trigger bus switches to determine if a gate was sent allowing notes to be made into rests. If the 8 seed notes are also put in a meaningful order you can flip back to sequential mode giving a repeating motif that you can latch on to within the more semi-random stuff. Try doing that on a computer! Recently had to fully test and evaluate an rare old modular synth. Splendid , I thought, a chance to try out another interesting old synth that I hadn’t seen before. Got to the current resting place to find it was an old PPG analogue modular that appeared to be a fair copy of and old Moog modular. Here’s the tough bit, all the controls were labeled in German! Started off by identifying the oscillators (only three – shame). Then had a brainwave, step back until the writing couldn’t be read and bingo everything became recognisable. Reason – it was such a good copy of a modular Moog that the knob layouts started to look familiar so various modules could be identified. From that observation I worked out the EIN and AUS were the inputs and outputs so with a fistful of patch cables the old beast was soon making some great sounds. One major difference (improvement) was that most module had several control voltage inputs. The sequencer was such a close copy of a Moog that I ended up operating it without reading anything. But all in all a very nice machine with a very classy filter, capable of some very nice sounds. One of the strangest thing I’ve looked at recently is a Yamaha Silent Piano. On paper it sounds a bit weird but here is the idea. As a bit of a nerd I was quite impressed by the optical detector system that determines which notes have been played and at what velocity. This is done by two beams per key (2 x 88). As a wired system would need two wires per beam this has been reduced by using optical fibres. This allows multiple beams to be derived from a single transmitter and that multiple beams can be received by a single receiver, thus reducing the electronics. The whole lot is arranged as a matrix that is being scanned at regular intervals fast enough to be able determine which of the keys have been pressed. As each key has to cut two beams then it is possible to calculate the speed the key is travelling by measuring the time taken between the beams being cut. On the one I looked at there was a small brass vane on the bottom of each key positioned so it cuts both beams. The bit that got me was that with headphones on and the piano in silent mode the brain links the clunk of the disabled hammer with the sound in the phones and projects the sound “into” the piano making the experience of playing very realistic indeed. Recent repair job was an old Gibson lap steel with an open circuit pickup. Closer inspection showed that the copper wire in the pickup was suffering from a terminal wire rot where there were patches of green oxide resulting in many breaks in the coil. Not having any equipment to do this I thought “it can’t be too hard to rewind a pickup by hand can it”. So I sourced some nice old 42AWG formvar coated copper wire, cut the old useless wire off and started winding. But the results were worth it. I was never quite sure about the claims for hand wound pickups but the sound of this one was superb, warmth and clarity in equal strength and a tone control that made a difference (as it matches the pickup very well). Why should this be, well the theory goes that a hand wound pickup there is less stray capacitance as the wires are not in neat layers that act as plates. I can see that makes sense. Trouble is I’m now hooked so I am now designing a pickup winder to speed up the process so I can experiment with winding a few pickups for myself to see if the “hand-wound is best” claim is actually true. Do the old ones really sound better? Had a reminder recently that some instruments deserve the reputation that they have. 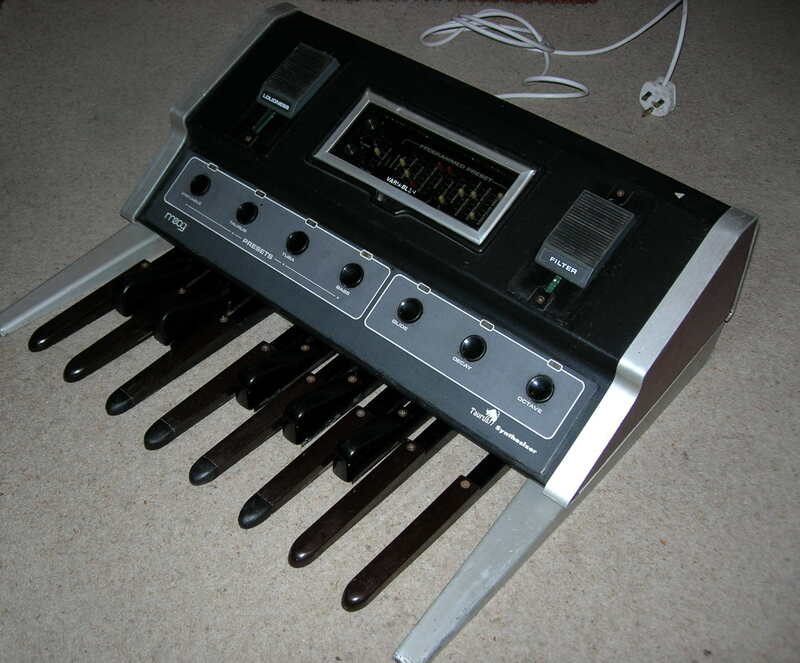 I was asked to sort out a very unwell set of Moog Taurus Pedals (the original version). I approached the task with a “whats all the fuss about” especially when the instrument was powered up and a very sick weedy sound was the result. A bit of investigation traced the fault to the power supply where the rail for the discrete logic would measure 5V under no load conditions but collapse when everything was connected up. Well most of the info from “members.aol.com/tronpage” is now available again, next job is to make sure that the search engines can find it. Meanwhile nothing else exiting to report on the synth front as most of the recent repairs have been amplifiers. Must have a rummage through my archives to find some interesting synth related stuff.